President Trump and his pro-oil political appointees say they want “energy dominance.” It’s the phrase they used in late December to justify rolling back offshore drilling safety rules adopted after the Deepwater Horizon disaster and again last week when they proposed expanding offshore drilling into every ocean off America’s coasts. While such macho-sounding rhetoric might play well with Trump’s base and the fossil fuel industry, it’s actually a dangerous delusion. There’s simply no way for the United States to safely drill its way to true energy dominance. But pursuing Trump’s unattainable goal would wreak havoc on coastal communities and imperiled wildlife and fuel global climate chaos. Despite near record-high oil production in 2016 — stemming from drilling and fracking that polluted air and water in communities across America — the United States still had net imports of almost 5 million barrels a day of crude and refined petroleum. Even trying to bridge that gap would turn all our oceans into oilfields, poisoning marine ecosystems with toxic fracking chemicals, industrializing scenic coastlines and increasing taxpayer subsidies of the oil industry. The Trump/Zinke offshore plan would open almost all federal waters to fossil fuel leases, including currently protected parts of the Arctic, Pacific and Atlantic oceans. 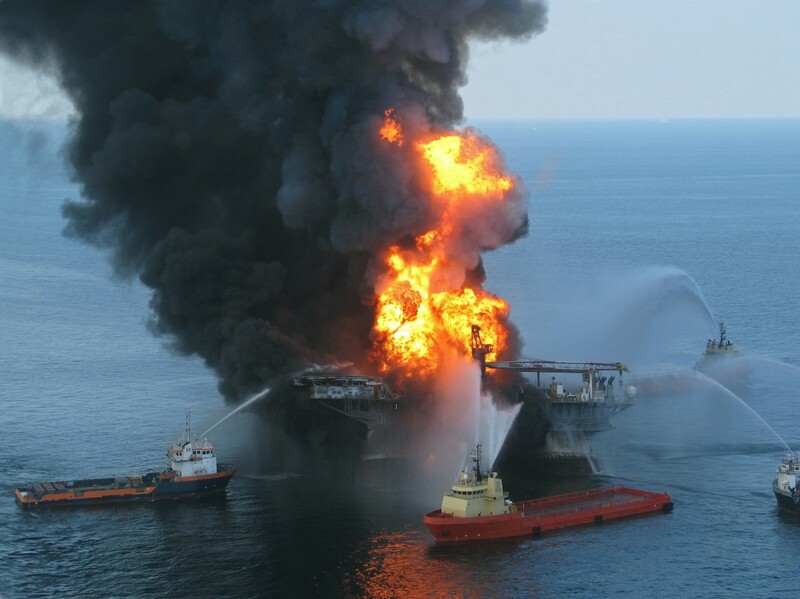 The initial proposal would even have opened up the eastern Gulf of Mexico, which still hasn’t recovered from Deepwater Horizon’s deadly oil spill. In reality, this administration is totally disregarding safety — that of workers and the general public — and environmental protection as it moves to let the oil and gas industry self-regulate. So perhaps this rhetorical shift from past presidential administrations seeking “energy independence” is appropriate: What they really seem to want is fossil fuel industry dominance over all other concerns. “Energy dominance” is a fairly new term that top Trump administration officials started regularly using last June. It was rolled out during “energy week” by Trump and a Washington Times oped, “Paving the path to U.S. energy dominance,” signed by Zinke, Energy Secretary Rick Perry and Environmental Protection Agency head Scott Pruitt — all of whom have long, deep ties to the oil industry. “Becoming energy dominant means that we are getting government out of the way so that we can share our energy wealth with developing nations. For years, Washington stood in the way of our energy dominance. That changes now,” they wrote. 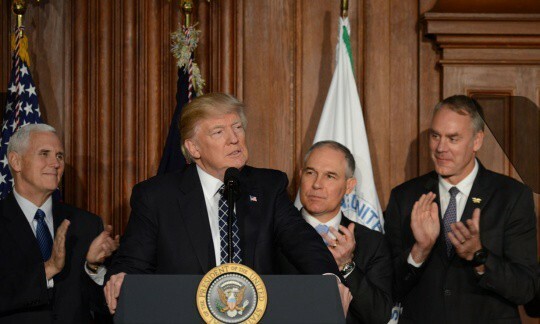 By those measures Trump’s rhetoric and policies — such as withdrawing from the global climate change accord, allowing drilling on more public lands and waters while rolling back regulations, repealing the Clean Power Plan’s attempt to make utilities more efficient, propping up the dying coal industry, and defunding renewable energy and efficiency programs — are a recipe for energy weakness, not dominance. But still, their delusional, chest-pounding dreams of “dominance” continue, egged on by industry groups such as the American Petroleum Institute and right-wing ideologues including The Heritage Foundation. Yet the real coercion now underway is this cynical campaign by the Trump administration and oil industry to sell the American people on the idea that we can safely ignore climate change, environmental protection and energy-market dynamics to emerge as an energy superpower embraced by people around the world. The more this cabal declares our dominance, the weaker our country will become. If you’re in California, here’s how we fight back. Longtime California newspaperman, now doing communications for the Center for Biological Diversity while still covering the Bay Area’s evolving culture.